Cooling temperatures and falling leaves reminds us it’s time to make winter travel plans. Whether you’re going to spend time with family for the holidays or simply enjoy some well-deserved time off from work, one of the best times to vacation is during the winter months — and there are plenty of luxurious, yet affordable options right here in the United States. We partnered with CheapOair to find the top 10 most popular travel destinations during December to March according to number of airline tickets sold last season, as well as the average cost to fly to the 50 biggest cities in the country. Fortunately, just because the most popular cities happen to be some of the most expensive to fly to doesn’t mean you have to blow your budget on a winter vacation. Below, we’ve identified the 10 most popular U.S. cities to travel to for winter, why they make such great vacation spots, and how you can save money on the expenses associated with staying there this year. Please include attribution to GoBankingRates.com with this graphic. All About Travel told me these Colorado cities “are two of the most expensive ski destinations.” Plus, it turns out they’re not even that popular when compared to the capital city of Denver — perhaps for that very reason. Denver takes first place in our list of the most popular cities to visit in winter. And there’s plenty to do there besides ski, all at a reasonable cost. What to do: Aside from the close to 30 ski resorts in the city alone, you can also visit the famous Red Rocks Park and amphitheater for breathtaking views and great music, or the nearby Rocky Mountains State Park. How to save: Flights to Denver become more expensive the closer it gets to ski season, so if you plan on booking a trip to the snowy city, locking in a flight now will ensure you save hundreds of dollars. Colorado’s tourism website also has a section dedicated to aggregating deals on travel and attractions in the city. Enjoying the beach is hard to do when it’s packed with summer vacation traffic and crowds. While you’ll find exactly the same atmosphere during the winter high season in our number two most popular city to visit, Ft. Lauderdale, the mild weather, excellent culinary scene and plentiful shopping make it all worth it. What to do: With a year-round temperature of 76 degrees, according to SmarterTravel.com, hanging out at the beach is why so many people travel to this Florida city during the coldest time of year; not to mention, it’s free. Also, you won’t want to miss the Seminole Hard Rock Winterfest Boat Parade in December. What to do: Hurdle-Bradford said it’s easier to obtain VIP reservations at fine dining establishments during this time. Additionally, it’s not nearly as crowded on the strip, which means shorter lines and lower rates for the most popular attractions. Los Angeles is home to a plethora of famous landmarks and attractions, not to mention just an hour or two away from the mountains, desert and beach. No matter what types of activities you’re interested in participating in during your winter vacation, whether it’s sightseeing, skiing or shopping, Los Angeles serves as a Southern California hub for it all. What to do: If you’d like a little culture, spend a day visiting the Museum of Natural History, MOCA or the Getty. The iconic Hollywood Blvd. and Rodeo Drive are also popular tourist destinations, while there are a number of nearby ski destinations surrounding the city. And don’t forget — Disneyland is just an hour away. How to save: Winter is definitely off-season in L.A., so the costs for attending major attractions, museums and theme parks won’t be at their exorbitant summer highs. In fact, the city is so big, you’ll probably have trouble packing in all the low-cost activities there are to do in one stay. About.com offers a directory of deals and discounts for Los Angeles attractions you can use to plan your days and cut costs. The Dallas-Fort Worth metroplex offers to distinct experiences connected to be the most popular destination in Texas to visit. While Dallas, home to the Cowboys, is invigorated by a sports-loving, urban population, Fort Worth offers the more authentic Texas experience of cowboys and rodeos. What to do: With an art museum, aquarium, zoo, botanical garden, numerous sporting events and the Stockyards, there’s no shortage of things to do in the Dallas-Fort Worth area. How to save: The Dallas Convention and Visitors Bureau offers travelers a directory of free things to do in Dallas, while the Fort Worth Bureau aggregates deals available on local attractions. Orlando is a top winter travel destination that is especially kid-friendly. While the summer months can be uncomfortably hot, humid and crowded, winter is perfect for enjoying all Orlando has to offer without the heat, long lines or inflated prices. What to do: Home to Disney World’s multiple theme parks, as well as Universal Orlando resorts and parks, lines will be much shorter during the season between the holidays and spring break. How to save: SmarterTravel.com states Christmas week is the most expensive time to stay in Orlando. However, prices drop following this week and stay low until spring break. The third Florida city to make the top 10 most popular winter vacation destinations, Miami offers many of the same benefits as Ft. Lauderdale and Orlando to winter travelers. However, you may find Miami has a younger club scene and more of a party atmosphere than other Florida spots. What to do: Miami is all about the nightlife and best for couples who want to enjoy restaurants and clubs in the city. The beach is still nice, albeit a lot cooler than in summer months. The Winter Music Conference also takes place in March. How to save: High season begins in January, so booking travel plans for December will ensure you aren’t subjected to inflated airline and hotel rates. It’s also much cheaper to stay on weekdays rather than weekends. New York City may be the perfect place to spend the holiday season. Snow, lights and ice skating make for a picturesque winter getaway, though certain weeks will be much more crowded — and expensive — than others. What to do: Jonathan Pappas of Solomon McCown & Company noted New York is one of the best destinations for winter travel, suggesting travelers check out “Central Park, skating in Rockefeller Center, restaurants like Serendipity and movies [that are] always being filmed.” Winter Restaurant Week and the the Chinese Lunar New Year are two unique events to catch as well. How to save: LonelyPlanet.com notes the time following New Year’s is when deals are plentiful, with many hotels offering third, fourth and fifth nights free. With a summer high season, winter travelers can enjoy all the artsy California city of San Francisco has to offer without the tourists and peak pricing. What to do: You will definitely want to visit Fisherman’s Wharf and the Buena Vista Cafe, “home to the Irish coffee.” The Golden Gate Bridge is another must-see attraction, as is nearby Alcatraz. How to save: About.com notes winter is the height of the city’s theater and performing arts season, so most hotels will run specials on room rates. “Most San Francisco hotels, even the luxurious Historic Hotels that dot the downtown shopping district and crown posh Nob Hill, usually offer great room specials during the winter.” Transportation is fairly cheap with cable cars running through the main parts of the city. While Phoenix isn’t exactly known for being a winter wonderland, its major airport Sky Harbor is the hub for end-of-year travelers who come to enjoy Arizona’s most charming nearby cities like Scottsdale. Liz Dahl of www.boomertravelpatrol.com says Scottsdale is ideal for the older, affluent crowd with lots of restaurants, shopping, nightlife and great weather. How to save: Because winter is high season in Scottsdale, the best way to reduce the cost of staying in the city is by renting a condo for an extended period or negotiating a good rate with a hotel by asking for last minute deals, according to Dahl. Additionally, a number of deals can often be found on Living Social and Groupon for hotel stays. 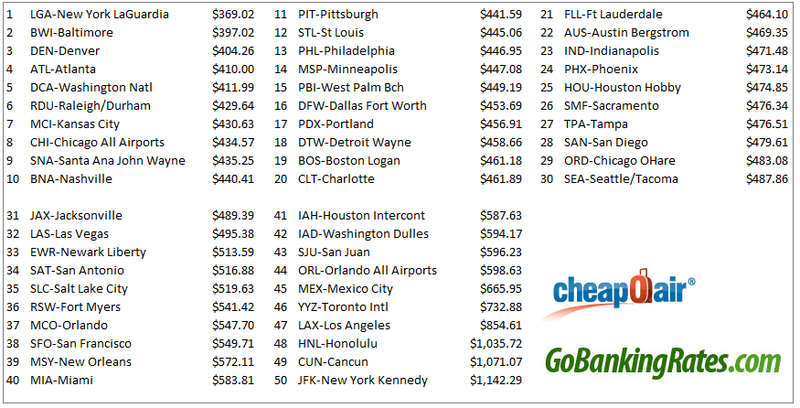 Below are the average airline prices for the 50 largest cities in the U.S. and nearby North American cities, based on last winter’s data, from least to most expensive. 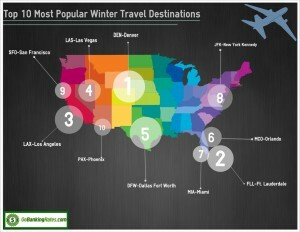 The 10 most popular cities for winter travel are based on CheapOair flight data (http://www.cheapoair.com/travel/travel_trends/) for December and January 2012. GoBankingRates sorted this data according total number of airline tickets sold during these months to rank destinations according to popularity. Cut college costs by attending one of these schools.